One of my favourite birds to see when out walking in the bush is a rather conspicuous little black bird called the fork-tailed drongo . The plumage is entirely black and the eye is the colour of red wine , closer inspection reveals a deeply forked tail , which is actually a result of the outer rectrices ( tail feathers ) being curved at the end . They are usually solitary and have small territories that they defend against any intruders with quite an aggressive display. This involves buzzing around the intruder and shouting at it vigorously . Even the largest of the eagles or a human passerby is not immune to this behaviour . Will also scold snakes and owls and even monitor lizards or mongooses , drawing attention to a potential predator in the area , which quite often attracts other bird species to come along and join in the mobbing behaviour . A gathering of birds of different species making a lot of noise is sure to indicate a snake , owl or some other kind of predator being scolded by the birds . Drongos are mostly insectivorous ,but will catch small birds , kill chicks in nests and have been seen plunge diving like kingfishers to catch small fish . They will feed on nectar if it is available .They have a small hook on the end of the bill which enables them to hold their prey firmly . Sensory bristles ( called rictal bristles ) are found around the mouth and nostrils, this gives them an advantage in catching prey . 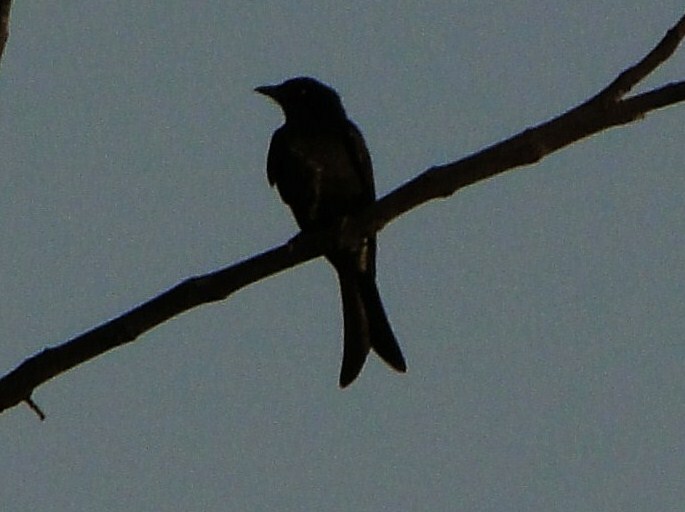 Drongos will typically hawk insect prey , this is done from a perch . As an insect is spotted they will fly out and catch it and then return to the same spot to devour it . The drongos often lead bird parties( mixed –species foraging flocks ) , which involves a mixture of different bird species feeding together for increased advantage, both in terms of food availability and also for increased vigilance from predators . Often seen catching insects that are disturbed by mammals as they forage through the bush . There are records in the Kalahari of the drongo mimicking the call of the pearl -spotted owlet when foraging around suricate troops . This causes the troop to scatter for cover leaving their food behind . The drongo then kleptoparasitises the leftovers . Other species of drongos have been observed making false alarm calls that scatter the other members of the bird party they have joined and results in better access to particular food sources for themselves . This bird is the only known host of the African cuckoo which is an intra-African migrant ( migrate within Africa moving north or south of the equator according to temperature and food availability ) and their distribution is very closely correlated in Southern Africa ( this is called sympatry ). The cuckoos are all brood parasites which means that they lay their eggs in the nests of other birds and the host female will incubate the egg and raise up the chick as her own . Drongos are monogamous in their breeding habits and usually lay three eggs between August and January . The African cuckoo has to mimic the pattern of the hosts eggs as close as possible in order for the single intruder egg not to be rejected by the host bird. The drongo is what is known as a discriminator , which means that she makes sure the eggs all match in the nest( some host species do not notice if the brood parasites eggs match and are called non-discriminators ) The female cuckoo may lay up to 25 eggs per season in different nests , usually one per nest, but she has to become a matcher in order for the eggs to be accepted . This is complicated by the fact that the drongo lays polymorphic eggs , each female having a different pattern . The drongo has up to six different egg patterns that it lays in order to confuse and outsmart the cuckoo . If a strange egg is detected amongst the clutch this will be removed from the clutch by the host .Statistically up to 50% of African cuckoo eggs are rejected by the host drongo . The cuckoos nesting peak is October and November , this corresponds to a time when there are hairy caterpillars around for them to eat and it correlates with the breeding period of the drongo . 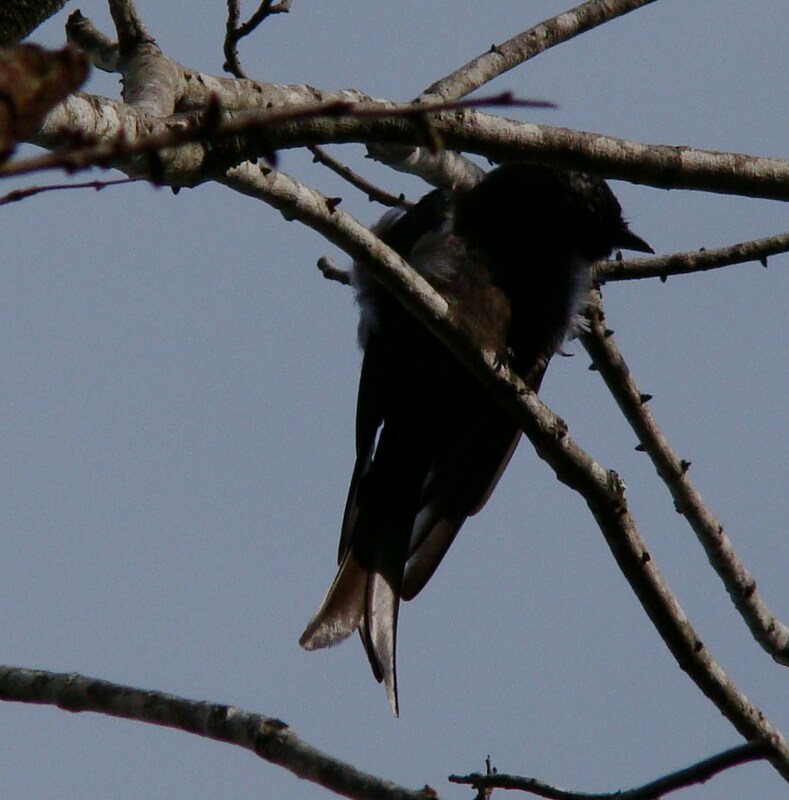 Be careful not to confuse the Fork Tailed Drongo with a similar looking bird , the Black Flycatcher . The flycatcher has only a slight indentation in the tail compared to distinct fork in the drongo’s tail . Drongo has a red-brown eye which shows when it catches the light , while the flycatcher has a dark brown eye . One of the ways to separate them them is whether the bird is bold and noisy , which will be the drongo or relatively quiet and unobtrusive ,which is more likely to be the flycatcher .